I have the honor of partnering with Beauty Marketing Immersion for a one day informative marketing class for emerging beauty entrepreneurs here. The Boost Your Beauty Business in 2019! 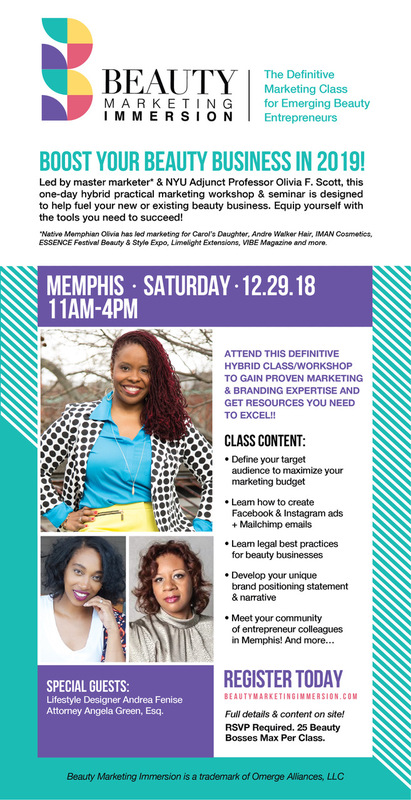 class will be held Saturday December 29th and led by master marketer and NYU Adjunt Professor Olivia F. Scott who has led marketing for beauty brands such as Carol’s Daughter, Andre Walker Hair, IMAN Cosmetics and more. The one day hybrid practical marketing workshop and seminar is designed to help fuel your new or existing beauty business. During the workshop, I will present an engaging and interactive branding “Curating the Style and Details of your Brand”. The presentation is designed to assist you in learning how to identify the wants, needs and desires of your ideal client and begin creating the visual aesthetics to craft a brand that captures their attention from the second they encounter your brand. The Beauty Marketing Immersion workshop has so much to offer in class content. It is incredible. You’ll learn how to define your target market, create Facebook and Instagram ads as well as newsletters that convert, brand positioning and so much more. Join Master Marketer Olivia F. Scott, Attorney Angela Green, and myself on Saturday December 29, 2018 at 11am.